Post Planner social media engagement software allows you to easily schedule and procure highly engaging content into various social media platforms. We’ve been a user for several years now and find it the best tool for curating content FAST. Click Here to go straight to the source. Use the “Search” feature to easily find amazing engaging images and articles. You can run very recent searchers or choose to go back several weeks. Choose engaging, funny, business, marketing, or top news. 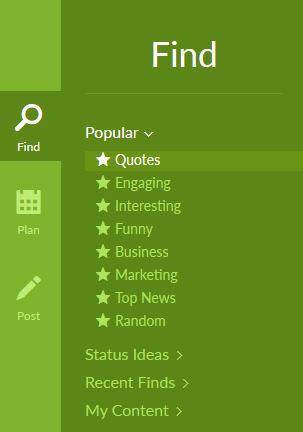 You can browse feeds based on industry or interest and create folders to save your favorite sources. An algorithm will suggest best posting times for you. If you add your own feeds, it’s possible someone else will grab from them which will increase your social exposure. For example, if you added a Zazzle feed just for cell phone cases, maybe a tech blog would save it as a place to source from. Add a Zazzle stream for dogs, and maybe a pet Facebook page will grab it as a source. Time is money, and who wants to search the Internet web for content? Who wants to spend money on a VA when in under an hour, you can schedule your own content that’s proven to perform? To learn more, CLICK HERE and read more about Post Planner.